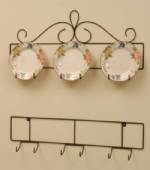 Our wrought iron, three place plate hangers and plate racks are designed to hold plates or pictures size 8 1/2" to 10" (but will hold as small as 7 1/4" plates) and is available in either a black or gold finish in a set of two racks. This vertical plate rack measures 6 1/2" wide x 37 1/2" high and features a 1 1/2" lip. Perfect for displaying collectible and antique plates. Hanging hardware not included although rack is easy to install with a few nails or screws, depending on the surface.